Western Digital has started to ship its SanDisk Ultra 3D drives based on 3D TLC NAND memory. The drives, which were formally introduced nearly two months ago, are identical in terms of hardware to the WD Blue 3D NAND SATA SSD, but come in different form-factors. As for pricing, Western Digital wants the SSDs to be affordable, which is why it sells the 1 TB models at below $300, in line with competiting drives from Crucial and Mushkin. 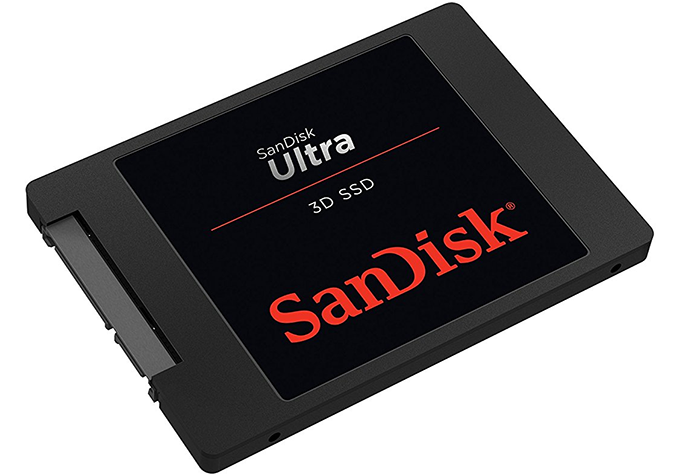 As reported, the SanDisk Ultra 3D as well as the WD Blue 3D NAND SATA are based on the Marvell 88SS1074 controller and use Western Digital’s 64-layer BiCS 3D NAND TLC memory. The drives take advantage of Marvell’s third-generation NANDeXtend LDPC-based ECC technology, but come with proprietary firmware developed in-house. The new products made in 250 GB, 500 GB, 1 TB and 2 TB configurations, but in different form-factors: the WD Blue 3D NAND SATA SSDs come in 2.5"/7mm and M.2-2280 form-factors, whereas the SanDisk Ultra 3D SSDs are only available in 2.5"/7mm DFF packaging. Western Digital rates its 3D TLC NAND-based drives for 1.75 million hours MTBF, which is higher than their drives featuring planar TLC memory, but a bit lower than the MTBF number offered by some competing drives. Meanwhile, the TBW ratings of the drives range from 100 TBW for the 250 GB models to 500 TBW for the 2TB models. Being a bit cautious with reliability/endurance ratings is normal because companies typically do not want elevated expectations when they deal with a new type of memory. From performance point of view, the new SanDisk and WD-branded drives and offer up to 560 MB/s sequential read speed and up to 532 MB/s sequential write speed (when pseudo-SLC cache is used to boost write speed), which is comparable to other mainstream SATA SSDs. As for random reads and writes, we are looking at 95K IOPS and 84K IOPS, respectively, again, in line with what competing drives offer. Since all SATA-based drives offer more or less similar performance, pricing becomes one of the main features of SSDs with this interface. As expected, Western Digital charges $99 for the entry level SanDisk Ultra 3D model with 250 GB capacity. Meanwhile, the drives with 500 GB and 1 TB memory are available for $165 and $280 from Amazon. As for the WD Blue 3D NAND SATA SSDs, the company promises on its web site that they will be available in “late summer 2017”, presumably at similar price points. I think that's the key to mushkins success. If their drives were better known there wouldn't be enough MLC to meet demand. For people in the know, it's a no brainer to buy Mushkin drives. Half their lineup still uses MLC. For sata slow transfers is not an issue since everything will reach 500MB+.